Momentum Carnivore Nutrition treats are a natural delicacy for dogs and cats and are intended for supplemental feeding. They are processed and vacuum-seal packaged for freshness, all in their manufacuring facility in Manitowoc, Wisconsin. 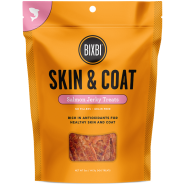 These salmon treats are rich in omega-3 fatty acids, which help improve skin and coat of your pet. Omega-3’s are a great nutrient to help joints as well. The treats are 100% raw and thus, retain the benefiial nutrients that cooked and heavily processed treats do not offer.